Sarah Huckabee Sanders is doing a great job as Press Secretary for President Trump, unlike Old-Guard-Cozy Sean Spicer who will now re-surface in the Rhino Washington D.C. establishment. HOWEVER . 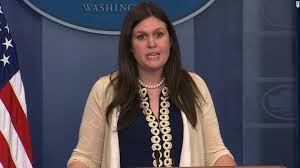 . .
Whoever directed Mrs. Sanders to affirm the non-existent “Russian meddling in our election” lie circa Aug 2, 2017 — made a tremendous mistake. Sarah Huckabee Sanders should CHALLENGE the “Russia election meddling” lie by asking the Press or the Democrats or the Republicans who maliciously (or mindlessly) repeat it — to DEFINE IT. Repeating the false premises of the Big Media, operating as hit men against the American people and patriots in public office on behalf of their Shadow Gov / Deep State owners and masters, – repeating the false premises of the Big Media is a long time sickness of patriots especially in Washington D.C. and New York City, but also across the nation. People apparently do this to try and send up a smoke signal of “peace” to the Big Media liars. This not only does not work, it destroys efforts to stand up for the truth, and encourages the Big Media to keep manipulating the nation. And, there is not one, single benefit to the people cow-towing to the Big Media false premises. On the contrary, it is absolutely necessary to always challenge or refute the false or unproven premises of the Big Media and Deep-Staters. Accepting such false premises is based on a subconscious sickness that “we will always have to deal with the Big Media”. So WRONG. The entire power of the FAKE, BIG MEDIA is based on their co-conspirators at ES &S, Hart, and Dominion (formerly Diebold) using their power over 99% of the USA vote count, with the disgraceful permission of all 50 Secretaries of State and 96% of our USA counties. (See ElectionNightGatekeepers.com ) So the false projections and false world views emanating from the Big Media would be irrelevant without their election night co-conspirators making their commentary and projections “come true”, or as close to true as they dare in light of relevant realities at the time. Without the easily-rigged computerized election nights, the Big Media would already be irrelevant, replaced by Social Media. We are NOT saddled with these malicious, traitorous Old Guard “news” outlets — as President Trump himself has proven with his use of social media such as Twitter and Facebook. It is inexact to call what those behind ES & S, Hart, and Dominion do on election night “hacking”. For those behind these three companies, it is NOT hacking, as they OWN the programs, they design the programming, and they do NOT need to hack into their own system. And you can bet your life they are making sure that nobody else hacks into their systems. But even if some other cyber-force did hack into their computers on election night — they would just change the results back to what they wanted the results to be BEFORE they were published and then relayed to National Election Pool (NEP) to pass on to the 5 Big TV Networks, to announce to the public. Back to the Intelligence community: we know Clapper is a liar and should be in jail for lying to Congress about what he and intelligence creeps are monitoring with regard to the American people. And, logically, all the people who are allies of Clapper’s who have winked at this — are arguably also liars. If former Congressman and current CIA Director Mike Pompeo is pushing all this Obama-era false intelligence on President Trump — he needs to be replaced. So, here’s hoping that press secretary neither Sarah Huckabee Sanders, or any other member of supporter of the Trump administration never gives credence to the “Russian meddling in our elections” hoax again, — but rather challenges it, and asks those pushing it to DEFINE it, and then PROVE what they are claiming.